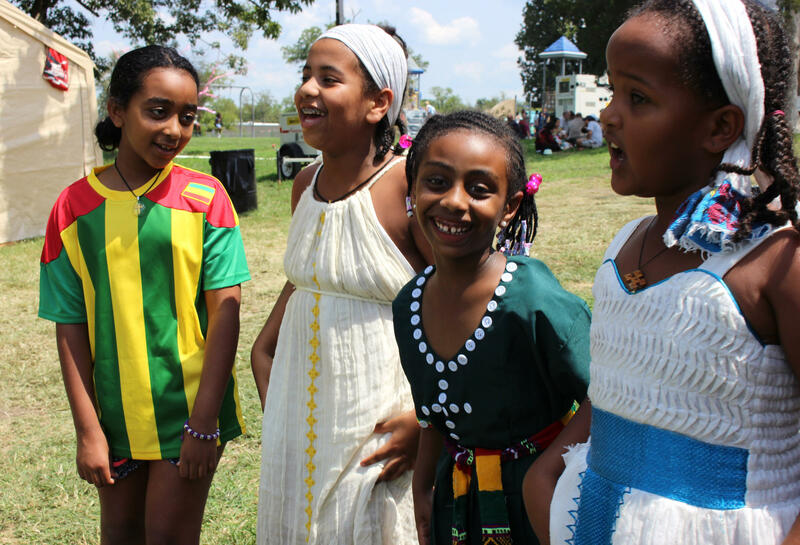 A few girls practice a traditional Ethiopian dance before they perform Saturday at Kansas City's annual Ethnic Enrichment Festival in Swope Park. Thousands flocked to Swope Park in Kansas City, Missouri, over the weekend for the 39th annual Ethnic Enrichment Festival. More than 50 booths offered traditional cuisine and crafts from countries around the world: sambusas from Kenya, helado de canela from Bolivia, bangers and mash from Scotland. 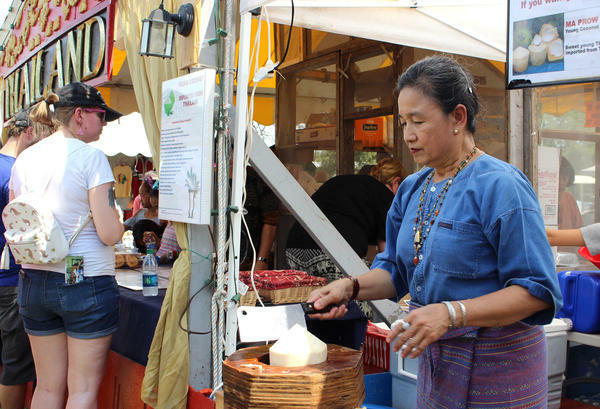 Each year at the Thailand booth, Oay Slaughter hacks a square opening in young coconuts, and serves them to customers with a straw. Other volunteers from the Thai Cultural Center of Greater Kansas City prepared dishes like moo ping, which is pork on a skewer, and Thai sausage called kaw-tom-mud. Slaughter first came to Kansas City from Bangkok as a teenager for a study abroad program. She studied industrial design, and ended up staying for work. She spends a lot of time volunteering with the Thai Cultural Center because she wants to preserve her own heritage, but also help keep it alive for younger generations that are increasingly distanced from it. "I believe that culture and heritage is a strong core inside every human being, everybody is supposed to have their culture and their heritage with them always, so they can be proud," Slaughter said. 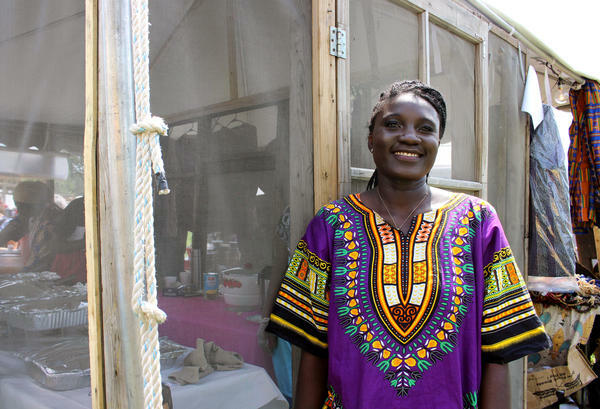 Kaway Secka, 25, was running The Gambia's booth with her mom, aunt and sister. She was born in the small west African country, but her family moved to Kansas City when she was five years old; her dad received a scholarship to study at Donnelly College. Secka said her favorite thing they serve is wonjo juice, which is made from dried hibiscus flowers. They also offered chicken yassa with rice and domoda, which is a peanut stew. Secka's mom often makes traditional Gambian food like this at home. 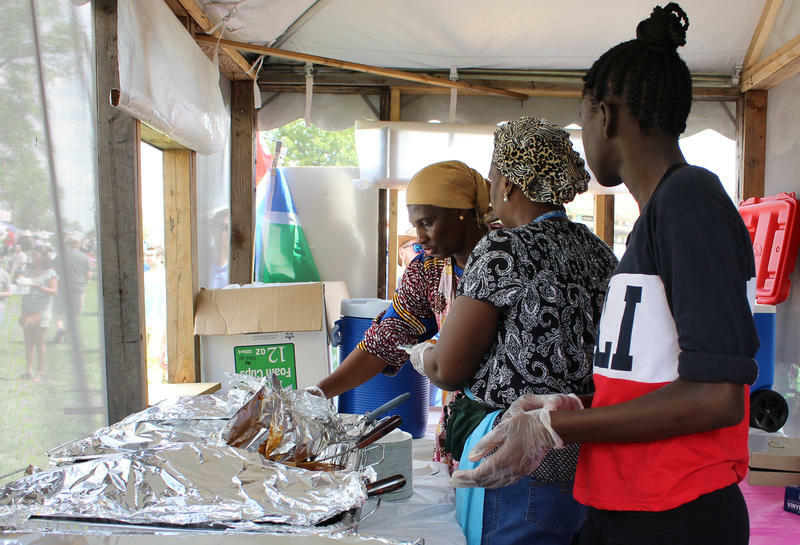 Secka also said she feels like the Gambian population in the Kansas City area seems to be shrinking, which is one of the reasons she's learning how to cook these dishes. "I try to keep my Gambia roots close to my heart," she said. "Gambia is a really small country, small population. This festival is a perfect time for everyone to get a little taste of Gambia." Volunteers from St. George Serbian Orthodox Church in Lenexa, Kansas, baked dozens of traditional Eastern European cookies and streudels for the Serbia booth, like pohance and slices of povitica, a sweet layered bread. Jovo Bencun's family immigrated to the U.S. in 1998 when he was 12. Immigration Services sent them to Kansas City. He said it was a culture shock at first, but a welcome change. Serbia was at war for five years of his early childhood, and he and his parents and siblings were shuffled between five refugee camps. "Not having a home, that was the hard part. But Kansas City is home now," said Bencun, who volunteered at the festival with his wife, Brandi. Still, he said he misses the "simple things," like Christmas in Serbia; they never had gifts, only large feasts which began before sunrise. 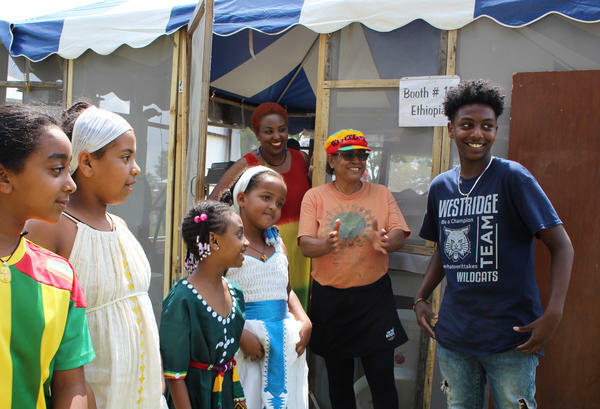 While the kids practiced their dance for the main stage, the adults at Ethiopia's booth served orders of key siga wot, or beef stew, over injera, a spongy sourdough flatbread traditionally meant for picking up bites of food. Melkam Mekonnen has volunteered at the festival for eight years. Her husband is from Ethiopia, and is now a priest at Medhani Alem Ethiopian Orthodox Church in Kansas City, Kansas. "I am so happy to tell other people who we are," she said. "People often don't even know where Ethiopia is, and they often connect it with hunger." Mekonnen said she's proud of her country, and enjoys opportunities like the festival to share the culture. Six women ran the Japan booth at the festival, rolling sushi in a small assembly line. They served California rolls, edamame and green tea popsicles. Tracey Whitman is on the board at the Heart of American Japan-America Society. She first came to the U.S. from Japan when she was 13, and said it took 10 years to meet any one else with Japanese heritage. "I lost a good deal of my culture," she said. That's why she got involved with the Japan-America Society, which she said is "a way for me to rediscover and make new connections to that culture."